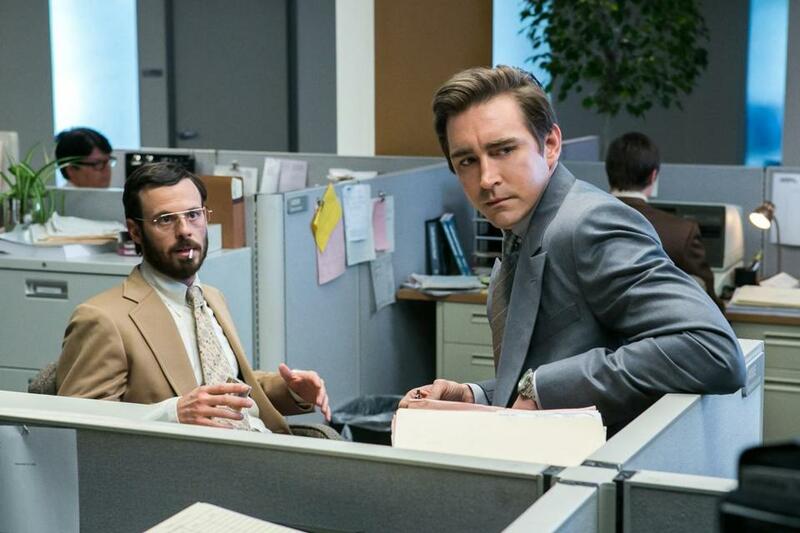 Scoot McNairy (left) as Gordon Clark and Lee Pace as Joe MacMillan in AMC’s new drama, set in the days of 1980s PC cloning. How do you top that act? It’s not easy, which is part of the reason AMC executives broke the final season of “Mad Men” in two — not just to get another round of ads and Emmy love but to buy time to grow a new hit or two. So far, the network has had only misses, including “Turn,” “Low Winter Sun,” and the third season of “The Killing.” While fellow basic-cabler FX has become an unstoppable maker of great shows, including “The Americans,” “Fargo,” and “Louie” to name a few, AMC just hasn’t found its curatorial legs. Which brings us to AMC’s latest effort, “Halt and Catch Fire.” The drama, which premieres Sunday at 10 p.m., has a lot of potential; it’s easy to see why the network chose it. Set in Dallas in 1983, it has a distinctive visual style — something AMC, with the cinematic “Breaking Bad” and the elegant “Mad Men,” wants to make part of its brand identity. About the infant days of the personal computing industry, it digs into material that has not already been done to death elsewhere on TV. And with a pair of unfamiliar and interesting lead actors, the show might be able to delve beneath the surface of its milieu. The title “Halt and Catch Fire” refers to an early command that sent a computer “into a race condition,” according to the opening moments of the premiere. “Control of the computer could not be regained.” The idea is that in the early 1980s, entrepreneurs big and small were rushing to clone the IBM PC, add their own ideas to it, and become the next industry giant. And that “race condition” doesn’t seem to have stopped 30 years later, as high-tech startups continue to try and fail and try again. Joe MacMillan, played by Lee Pace, is the ambitious, manipulative sales guy who essentially forces a small firm called Cardiff Electric into the competition to create a PC clone. Joe is sneaky, pushy, and effective, a kind of Don Draper by way of Patrick Bateman of “American Psycho.” He knows he needs a tech-minded guy on his side, so he draws the reticent Cardiff employee Gordon Clark (Scoot McNairy) into helping him reverse-engineer an IBM. Gordon and his wife, Donna (Kerry Bishe), built a computer a few years earlier that failed to catch on; he is a drone at work, until Joe seduces him back into risk-taking. Gordon is the Steve Wozniak to Joe’s Steve Jobs, in a way. Add to that dynamic immature 22-year-old coding expert Cameron Howe (Mackenzie Davis), who is a nascent Lisbeth Salander from “The Girl With the Dragon Tattoo,” and you’ve got a chemical mixture on the verge of exploding. While “Halt and Catch Fire” captures the professional and financial excitement and mystery of those days, before we knew computers would change the world, it also takes on the complex personalities involved. Each member of the team is a kind of tech type: Joe the maverick who is always a step ahead of everyone else, Gordon the visionary who can’t succeed without a mover like Joe, and Cameron the bratty hands-on genius. Pace is particularly fascinating as Joe, a guy who was off the grid for a period before the show starts. I first saw Pace as a transgender in the 2003 movie “Soldier’s Girl,” and he was a revelation. He followed that with strong turns in “Wonderfalls” and “Pushing Daisies.” In “Halt and Catch Fire,” he marries a bullying quality to desperation and comes up with something different and compelling, a slick ’80s businessman with a ghost on his shoulder. The show also benefits from its stylized appearance, with a go-go pace and enough 1980s fashions to conjure memories of the Go-Go’s. It looks like a synthesizer sounds — a little plastic, with some 1970s paneling lingering in the backdrop. Because it’s set in Dallas — Silicon Prairie — and not Silicon Valley, there are cowboy hats and accents, most noticeably from the old school Cardiff boss John Bosworth (Toby Huss), who isn’t happy about having been cornered into Joe’s big plan. Here’s the problem, and it’s the problem almost every time a network sends out only one episode for preview. It’s really hard to tell whether “Halt and Catch Fire” will go on to tell its story with any narrative confidence. Will the writing pan out over time, or is the pilot a fluke? It was created by the somewhat unknown team of Christopher Cantwell and Christopher C. Rogers, so there’s no track record to rely on. Just hope, both for viewers and for a network in need.